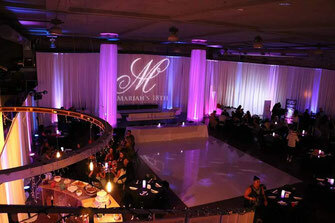 Let Magic Uplighting, Inc. take your vision and create an unforgettable experience. As the leaders in wireless event lighting concepts in Chicago, we are proud to offer the latest technology in the event industry! 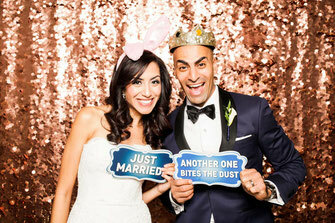 Our Photo booths are the best in the Chicago area, just look at all of our reviews online. Choose from our Classic Enclosed, Open Concept, Green Screen Photo booth, Inflatable Cube Photo booth, Social Booth and L.E.D Social Booth! 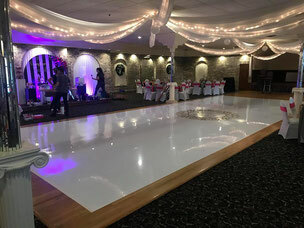 We customize your Dance Floor specifically to your event. Creating any shape, size, and color. We custom design logos, borders or pictures that is inimitable to you and your event. 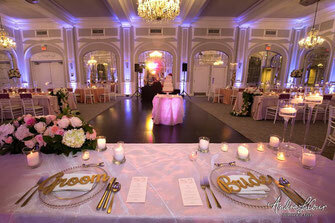 We customize and design your wedding or event monogram from our in-house design team. From a number of fonts to choose, colors and design concepts, we make it happen! 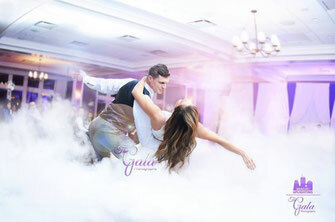 An amazing dry ice effect that imitates "Clouds" for your special moment, the First Dance. Our effect is safe for all venues and we also carry our Certificate of Insurance. We carry multiple fabrics in different colors and can make any design you can imagine. Our drapery can be used for head tables, walls and complete venue transformations. We guarantee you will not be disappointed with our rates and packages. No more traditional so called venue uplighting, when we offer more options for your event. You will see the difference and transformation uplighting has on your venue or hall. Our L.E.D fixtures will have a magical touch to your reception. 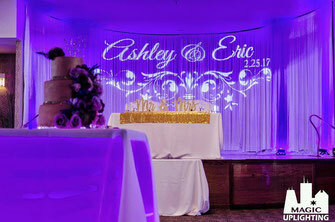 Custom Monograms with your name initials and date of your event will add the "Wow" factor to your guests upon arrival. Please feel free to look at our samples and check out what uplighting technology has to offer. We also offer a client referral program. Call or Text us today for available dates and specials. We go the extra mile in making your event a night to remember!